The first time I tried to make falafel was the same day I was firted from a job for the first (and thus far, only) time. I suppose that should have told me something. Despite following the instructions provided by the wonderful and usually reliable Lynne Bedford-Hall, they were impossibly fally-aparty, and if I remember correctly I ended up having to bake rather than fry them, which made them unpleasantly dry. Since then I’ve attempted falafel many times, with consistently disappointing results. Either they disintegrate on hitting the hot oil, or they are leaden and tasting of raw flour, or they’re as heavy as little chickpea cannonballs. On one memorable occasion, I slaved away for ages making the Leon sweet potato falafel for a vegetarian friend who turned out to be a sweet potato hater. It was a sorry saga of woe, and the only question is why I kept trying. Last night the madness descended again, and I decided to attempt carrot falafel, using some chickpeas I’d soaked and cooked earlier in the week for another recipe, and ended up not using. Here is what I did. Put the chickpeas (about 400g) in the food processor together with one small onion, two cloves of garlic, a generous teaspoon each of ground cumin and coriander, fresh coriander and/or parsley if you have any (I didn’t) and some chilli flakes. Whizz to a crumbly fineness. Grate in two carrots. Add a heaped tablespoon of flour and an egg. Process again and season. Tip the mixture into a bowl and check the texture – it should be damp and loose, but seem amenable to holding together when squeezed. If you need to, add a little more flour. Refrigerate the mixture for an hour or so, before rolling into small balls and resting in the fridge again (I find with burgers, meatballs and anything of this nature, resting is absolutely crucial). Twice the weight in flour as volume of water (eg 200g to 100ml). Mix the bath-hot water with a teaspoon of sugar and a couple of teaspoons of yeast, and leave to activate while you mix the flour (use strong bread flour, half white and half wholemeal if you have it) with some salt and cumin seeds. Add about 25ml of olive oil, then the water and yeast, and knead for five minutes. Add more flour or water if it needs it – it should be a pliable, bouncy, silky dough. Leave in a warm place for an hour to rise, knock back, allow to rise again, then form into balls, roll out very thinly, and cook in a dry pan for a minute or two on each side. I am relishing my fabulous falafel glory. I’m sure it will never happen again. 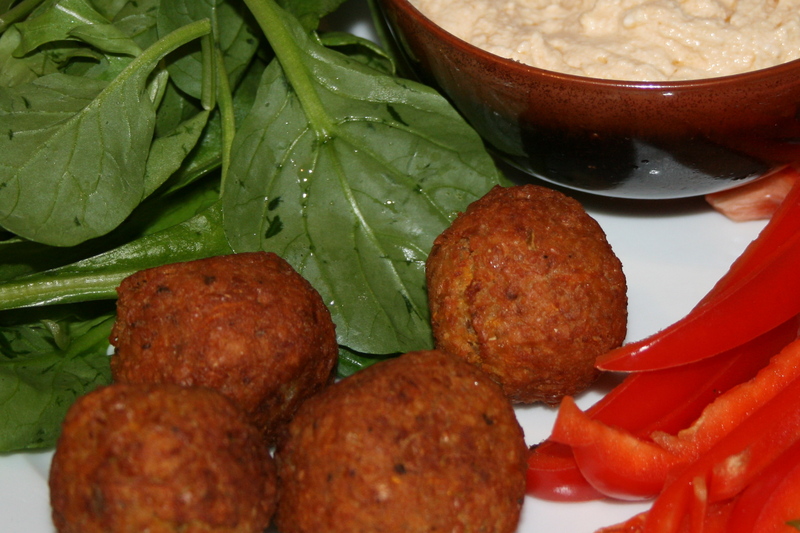 Claudia Roden’s falafel recipe in the Book of Jewish Food works very well. They don’t fall apart.